“Hocus Pocus, abracadabra”, get ready for a bag full of tricks from the master of magic on Magic Ian Slot at Vegas Spins! Designed by Blue Print, the game has a 5 reel and a 25 payline slot. With its impressive visuals and stunning background set in an old theatre, it includes reels like cards, flowers, top hats, magic wands, locked boxes and the Magic Ian icon. The game also comes with some magical features not found in other games, for you to discover. Let the show begin! For you to enjoy the magic show, you will first need to have an account at Vegas Spins. Sign up here if you haven’t and log in if you have, it is that easy. Once you have done with that, you are just left with setting your betting options to your desired preference. Then click on SPIN and you are set for the game. You will trigger a win if you are able to match 3, 4, 5 symbols on a line and with 3 Bonus Scatter icons, you can enter the circle of Magic Bonus round. 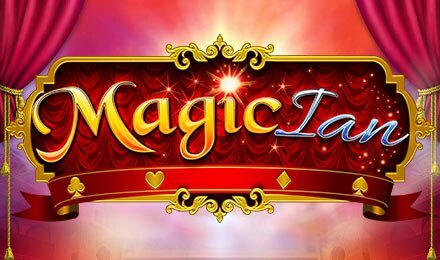 Bet Levels: There are no bet levels required on Magic Ian Slot. Amount of Paylines Selection: 25 paylines remain active during the game but that can increase up to 50 paylines if you trigger Expanded Reels as one of the features on this game. Coin Values: The coin value ranges from 0.25 to 125.00 respectively. There is a White Rabbit icon in this game which stands as the main wild symbol and it replaces all the rest for winning a game except for the Ian bonus symbol. A variety of helpful modifiers appear at different times within the game to provide more chances and they are Expanding reels, Levitation Spins, Teleport Spins, Mirrored Reels, Chest of Wonder, Symbol of Surprise, Magical Streak, Shuffling Symbols, Bonus Boost and Super Bonus Spin. To enter the special bonus round you will first need to pick up 3 Bonus symbols on the same spin. Afterwards, you can select cards that have extra features. If a card mentions SPIN it will trigger the wheel to spin and therefore you get an additional feature like Cash Prize, Magic Rope Spins, Teleport Spins, Levitation Spins and Metamorph Spins.